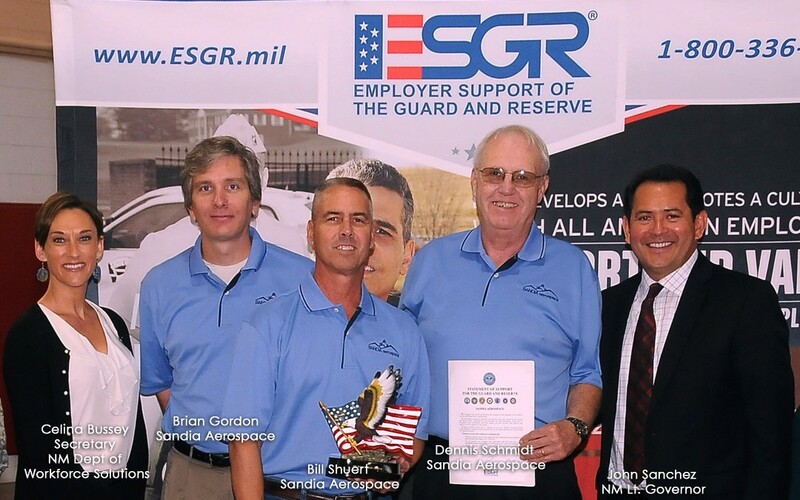 Albuquerque, NM – Nov 2, 2015: Sandia Aerospace was presented the NM Patriotic Employer award the ESGR (Employer Support of the Guard and Reserve) luncheon and awards ceremony in Albuquerque, NM. The Award goes to companies that support American veterans in the National Guard and Reserve who have honorably served their country. Through the ESGR and the support of private industry, the unemployment rate for New Mexico National Guard and Reserve units has decreased from a high of 22% in 2012 to its current level of just over 3% in 2015. Dennis Schmidt, Sandia Aerospace President said “Sandia Aerospace stands proud in support of our countries veterans. They are well trained and disciplined and make terrific employees”.